As an avid collector of free alternatives to commercial software, I'm constantly looking for free software. The best options, however, are online ones. That is, web sites that do what some software can do, and do it well ... some times done even better than the paid software. All in all, online options help feed into my cloud computing initiative where I rely on less and less of my own resources, and more on that of the web sites I visit. With the proliferation of social media and networking sites, one's own profile is becoming increasingly important. Of course, it plays a major role in one's digital brand but that is a conversation for some other time. Choosing the correct picture for your profile, especially on sites like LinkedIn (a career oriented networking site), is vital. Most people put a head shot of themselves. In this day and age, and in this economy, it's all about distinguishing yourself, and that's where I think a pencil sketch of your photo could come in. Of course, a different photo for your profile will likely make you more memorable in other sites like Twitter, Facebook, etc. Yes, you could do that with Photoshop, Paint Shop Pro, etc. What if there online options that do it faster, and just as good (or very close to the same) as those costly commercial ones? I have three of those for you. Dumpr Photo Pencil Sketch is an awesome online tool to turn any photo or picture into a good pencil sketch. Now don't limit yourself to pictures of your children, and instead think of pictures for your children: Pictures for them to paint in, color over, etc. 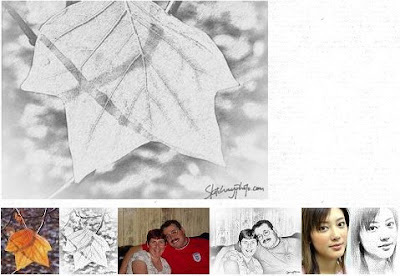 Sketch My Photo, like Dumpr, is also a free instant & online photo to pencil sketch conversion site. This one, however, adds a signature of the company onto your converted photos. A bit of creativity and you can easily get around that; and the signature is not that bad or intrusive any ways. BeFunky is the last and final option, but it's also the most fun one. 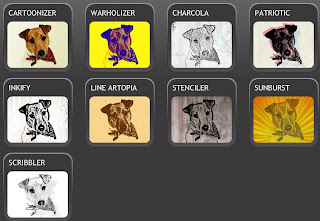 This site goes beyond a free & quick photo to pencil sketch solution, it's an online experience. BeFunky gives you so many other options to manipulate your photos & pictures like inkifying them, stenciling them or charcolize them. There are a lot of options. You can even add frames, effects, etc. A very well thought out and done site. Their pencil sketch specifically, however, is not as good as the other two; but the overall experience is a blast. Do you know of any free online tools for image manipulation and alteration? Please share them in the comments. There is a website where you can simply convert your photo to sketch or painting or drawing or B&W with different colors with maintaining actual size..